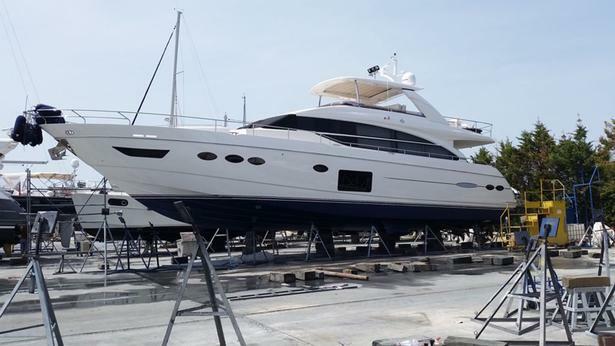 The 38.4 metre motor yacht Blue Agave has been sold by Nautique Yachting in an in-house deal. Designed inside and out by Francesco Paszkowski, she was built in GRP to RINA class and MCA coded by Italian yard Sanlorenzo and delivered in 2015 as one of the yard’s SD126 models. An interior with satin finished anigre wood panelling accommodates up to 12 guests in five cabins consisting of a main deck master suite with two VIP suites and two twin cabins with Pullman berths below, all with entertainment centres, LED television screens and en suite bathroom facilities. In addition, there are quarters for six crew. The large saloon has ample seating on an L-shaped sofa and armchairs, coffee tables and an entertainment centre including a 42 inch television screen and a stereo surround sound system. The aft deck welcomes al fresco dining and entertaining on a selection of chairs and tables while the sun deck offers a Jacuzzi spa tub and sun loungers. Up on the flybridge is a barbecue grill, fridge, ice maker and a seating area shaded by a custom hard top. More sunbathing is available on the loungers and sun pads situated on the foredeck while the sky lounge plays host to comfortable seating and an entertainment centre featuring a 37 inch television screen. Twin 1,622hp Caterpillar C32 Acert diesel engines allow a cruising speed of 11 knots topping out at 17 knots. Blue Agave was asking $13,900,000.